In 1964 George Mueller visited Marshall and casually introduced us to his philosophy of "all-up" testing. To the conservative breed of old rocketeers who had learned the hard way that it never seemed to pay to introduce more than one major change between flight tests, George's ideas had an unrealistic ring. Instead of beginning with a ballasted first-stage flight as in the Saturn I program, adding a live second stage only after the first stage had proven its flightworthiness, his "all-up" concept was startling. It meant nothing less than that the very first flight would be conducted with all three live stages of the giant Saturn V. Moreover, in order to maximize the payoff of that first flight, George said it should carry a live Apollo command and service module as payload. The entire flight should be carried through a sophisticated trajectory that would permit the command module to reenter the atmosphere under conditions simulating a return from the Moon. It sounded reckless, but George Mueller's reasoning was impeccable. Water ballast in lieu of a second and third stage would require much less tank volume than liquid-hydrogen-fueled stages, so that a rocket tested with only a live first stage would be much shorter than the final configuration. Its aerodynamic shape and its body dynamics would thus not be representative. Filling the ballast tanks with liquid hydrogen? Fine, but then why not burn it as a bonus experiment? And so the arguments went on until George in the end prevailed. In retrospect it is clear that without all-up testing the first manned lunar landing could not have taken place as early as 1969. Before Mueller joined the program, it had been decided that a total of about 20 sets of Apollo spacecraft and Saturn V rockets would be needed. Clearly, at least ten unmanned flights with the huge new rocket would be required before anyone would muster the courage to launch a crew with it. (Even ten would be a far smaller number than the unmanned launches of Redstones, Atlases, and Titans that had preceded the first manned Mercury and Gemini flights.) The first manned Apollo flights would be limited to low Earth orbits. Gradually we would inch our way closer to the Moon, and flight no. 17, perhaps, would bring the first lunar landing. That would give us a reserve of three flights, just in case things did not work as planned. An Instrument Unit being readied for checkout at the IBM facility in Huntsville. A cylinder 22.7 feet across and 3 feet high, the structure consists of 24 panels with stiffening rings at the top and bottom. The units that perform the guidance, control, and telemetry functions for the Saturn are mounted to the inside of the cylinder. The foam rubber pads at the top, and the plastic strips around the outside, are for protection during manufacture. Mueller changed all this, and his bold telescoping of the overall plan bore magnificent fruit: With the third Saturn V ever to be launched, Frank Borman's Apollo 8 crew orbited the Moon on Christmas 1968, and the sixth Saturn V carried Neil Armstrong's Apollo 11 to the first lunar landing. Even though production was whittled back to fifteen units, Saturn V's launched a total of two unmanned and ten manned Apollo missions, plus one Skylab space station. Two uncommitted rockets went into mothballs. Pressure test during predelivery checkout of an Instrument Unit at the IBM facility. This IU was destined for Saturn vehicle 505, which launched the Apoilo 10 mission. On the launch pad, the IU, which weighs two tons, sits atop the third (S-IVB) stage, with the Apollo spacecraft directly above it. But let us go back to 1962. To develop and manufacture the large S-11 and S-IVB stages, two West Coast contractors required special facilities. A new Government plant was built at Seal Beach where North American was to build the S-11. S-IVB development and manufacture was moved into a new Douglas center at Huntington Beach, while static testing went to Sacramento. The Marshall Center in Huntsville was also substantially enlarged. A huge new shop building was erected for assembly of the first three S-IC stages. A large stand was built to static-test the huge stage under the full 7,500,000-pound-thrust of its five F-1 engines. These engines generated no less than 180 million horsepower. As about 1 percent of that energy was converted into noise, neighborhood windows could be expected to break and plaster rain from ceilings if the wind was blowing from the wrong direction or the clouds were hanging low. A careful meteorological monitoring program had to be instituted to permit test runs only under favorable weather conditions. Although the most visible and audible signs of Marshall's involvement in Saturn V development were the monstrous and noisy S-IC engines, equally important work was done in its Astrionics Laboratory. The Saturn V's airbearing-supported inertial guidance platform was born there, along with a host of other highly sophisticated electronic devices. 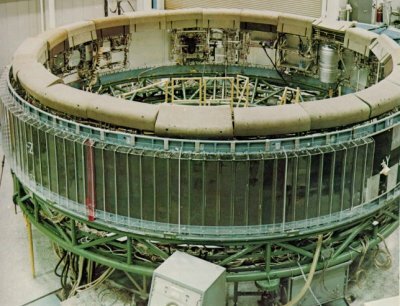 In the Astrionics Simulator Facility, guidance and control aspects of a complete three-stage flight of the great rocket could be electronically simulated under all sorts of operating conditions. The supersonic passage of the rocket through a high-altitude jet stream could be duplicated, for instance, or the sudden failure of one of the S-11 stage's five engines. The simulator would faithfully display the excursions of the swivel-mounted rocket engines in response to external wind forces or unsymmetrical loss of thrust, establishing the dynamic response of the entire rocket and the resulting structural loads. Super Guppy, bigger sister of the aptly named Pregnant Guppy, was the only airplane in the world capable of carrying a complete S-IVB stage. Both aircraft were built by John M. Conroy, who started with the fuselages of two surplus Boeing C-97 Stratocruisers, ballooned out the upper decks enormously, and hinged the front sections so that they could be folded back 110 degrees. Super Guppy flew smoothly at a 250-mph cruising speed, and its cargo deck provided a 25-foot clear diameter. Below, a finished S-IVB stage is being unloaded onto a cargo lift trailer at Kennedy Space Center. The Saturn V's own guidance system would guide the Apollo flights not only to an interim parking orbit but all the way to translunar injection. It fed position data to the onboard digital computer, which in turn prepared and sent control signals to the hydraulic actuators that swiveled the big engines for flight-path control. As propellant consumption lightened the rocket, and as it traversed the atmosphere at subsonic and supersonic speeds, the gain settings of these control signals had to vary continuously, for proper control damping. Serving as the core of the Saturn V's central nervous system, the computer did many other things too. It served in the computerized prelaunch checkout procedure of the great rocket, helped calibrate the telemetry transmissions, activated staging procedures, turned equipment on and off as the flight proceeded through various speed regimes, and even watched over the cooling system that stabilized the temperatures of the array of sensitive blackboxes within the IU. So although the working flight lifetime of the Saturn computer was measured in minutes, it performed many exacting duties during its short and busy life. Bulky but fragile, huge launch-vehicle stages could not travel by rail or public road; tunnels, bridges, and low wires would have dictated endless detours. Right, even a comparatively small Saturn I wasn't easy to back into its barge at Huntsville. Below, a rocket-laden barge is escorted by two tugs through Sun-bronzed waters. 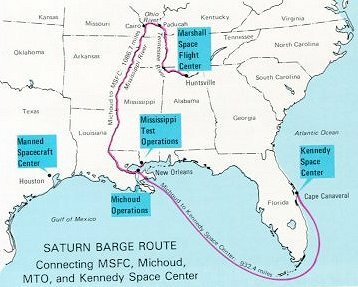 The biggest California-built parts of Saturn V voyaged by ship through the Panama Canal and across the Gulf of Mexico. Why was the big rocket so reliable? 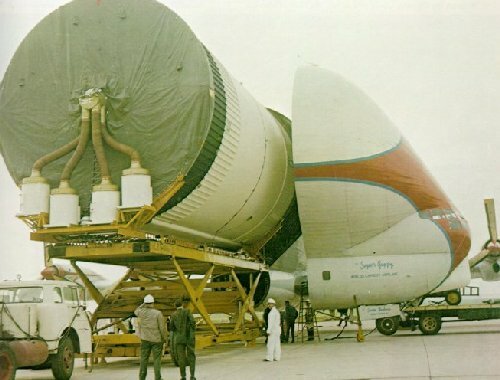 Saturn V was not overdesigned in the sense that everything was made needlessly strong and heavy. But great care was devoted to identifying the real environment in which each part was to work - and "environment" included accelerations, vibrations, stresses, fatigue loads, pressures, temperatures, humidity, corrosion, and test cycles prior to launch. Test programs were then conducted against somewhat more severe conditions than were expected. A methodology was created to assess each part with a demonstrated reliability figure, such as 0.9999998. Total rocket reliability would then be the product of all these parts reliabilities, and had to remain above the figure of 0.990, or 99 percent. Redundant parts were used whenever necessary to attain this reliability goal. 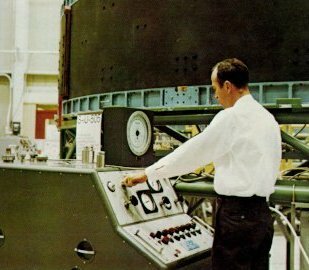 Marshall built an overall systems simulator on which all major subsystems of the three-stage rocket could be exercised together. 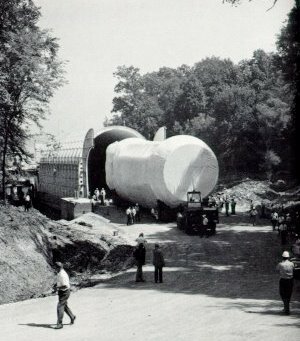 This facility featured replicas of propellant tanks that could be loaded or unloaded, pressurized or vented, and that duplicated the pneumatic and hydraulic dynamics involved. Electrically, it simulated the complete network of the launch vehicle and its interfacing ground support equipment.